WRD offers a graduate certificate in Professional and Technical Writing that provides immediate workplace skills and knowledge. The certificate is designed for non-traditional and/or non-resident students who are interested in continuing their education in professional and technical writing. All courses are online, and the certificate can be completed in a flexible and timely manner. active technical writers interested in learning new skills and advancing in their current place of employment. The certificate requires 9 credits. Students must take WRD 702, but can choose from two of the remaining three courses. Courses are offered on an accelerated 8 week schedule. WRD 702 Professional and Technical Writing (required). This course teaches the genres of professional and technical writing. 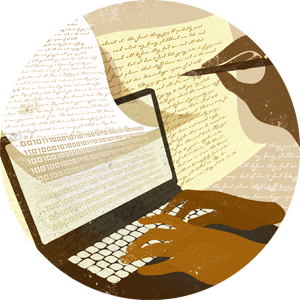 WRD 612: Ethical and Legal Issues in Technical Writing. 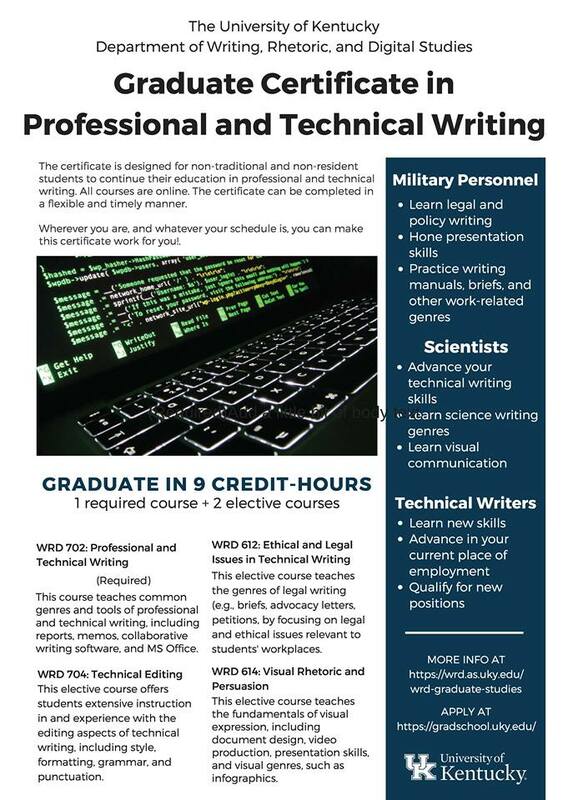 This course teaches the genres of legal writing – briefs, advocacy letters, petitions – by asking students to focus on important legal and ethical issues relevant to their workplace (military personnel file such documents on a regular basis regarding injury, death, lost equipment, policy issues; scientists must address ethical and legal concerns of their work). WRD 614 Visual Rhetoric and Persuasion. This courses teaches the fundamentals of visual expression - essential to all technical and professional writing - including document design, video, presentation skills, and the usage of specific visual information tools such as infographics. WRD 704 Technical Editing. This course offers students extensive work in the editing aspects of technical writing which include attention to style, format, grammar, and punctuation. The cost of the program is $693 per credit hour. To apply, please visit the Graduate School's application page. Futher infromation regarding Graduate School applications can be found here.